25 plus years experience as a trainer and coach. Nutritional Therapy Practitioner (NTP), NASM Certified Personal Trainer, CHEK Holistic Lifestyle Coach, yoga instructor, Pilates mat instructor, USA Triathlon Level One certified coach. Also competitive age group runner, cyclist and triathlete. Mark Allen Online Elite Team 2003-2012. Owner of private fitness studio specializing in 30 minute personal training sessions in downtown Bellevue, Washington. Rated one of the top one hundred personal trainers in the United States in 2004 and 2005. Host of "The WHOLE Athlete" podcast and creator of the "The WHOLESTIC Method" to burn fat, optimize health and improve performance in life and sports. Author of LIFE IS NOT A RACE and The WHOLESTIC Method Manual on Amazon. 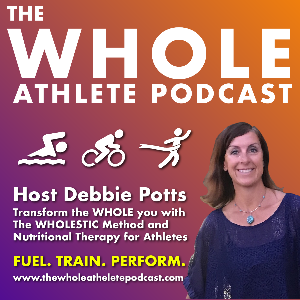 Improve your performance by improving your nutrition, exercise, sleep, stress, movement, digestion/gut health, hydration and happiness = The WHOLESTIC Method approach to coaching the WHOLE Athlete from the inside out. There is more to improving performance that how you train! Ask Debbie for more prices and packages. Success. Coach Debbie Potts has been notified of your message.